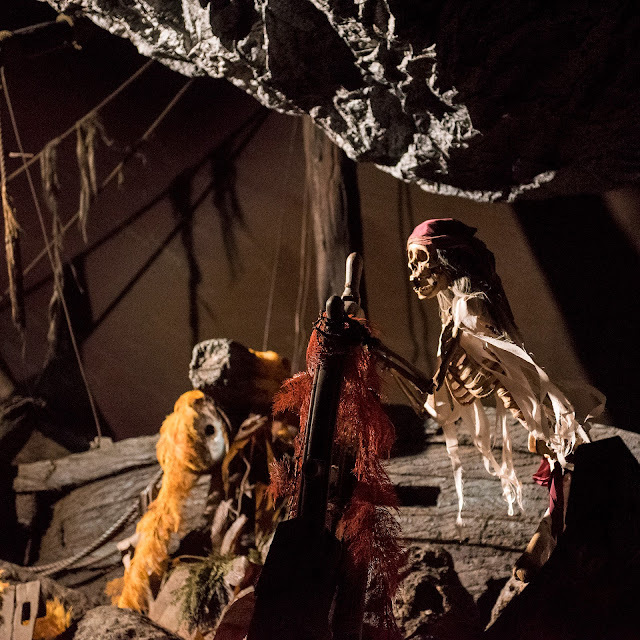 It's a classic scene among many on Pirates of the Caribbean--a lone skeletal pirate, bony fingers grasping a rudder, struggling to guide his craft through rough seas in the middle of a maelstrom. He is illuminated briefly by lighting bursts but otherwise fights through the shadows. Forever doomed to sail the watery pall, he serves as a grim warning to any who spot him. Dead men tell no tales, but one wonders what story he might have, were he able to talk. A dead pirate pushes through buffeting waves on Pirates of the Caribbean.